You’ve asked and we’re ready to answer – yes, there is a Lucktastic scam out there! No, the scam has nothing to do with the official Lucktastic app. Just when we think that fraudsters have exhausted all opportunities, they come up with something new. 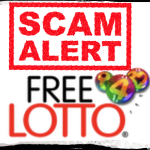 While mega lottery scams like the ones targeting Powerball or EuroMillions have been exposed time and time again, new fraud attempts are now targeting alternative lotteries that are a bit more obscure. The Lucktastic app is one such more exotic option that dozens of people are still unfamiliar with. This is probably why scammers have chosen it in an attempt to win some cash in a completely criminal way. Before moving on to describing the scam itself, let’s take a look at what Lucktastic is. You can actually find a lot about the app in the Lucktastic review, we’ve written about it. Lucktastic is a mobile app that gives lottery enthusiasts a quick and easy chance to test their luck. It’s free to try – all that you have to do is download it on your phone. The fact that Lucktastic is completely free is something to keep in mind, especially if fraudsters contact you and ask for the payment of a certain fee. The app features scratchcard games. Whenever the player wins a prize, some of the winnings will be used for the acquisition of new tickets and some can be cashed out (typically as gift coupons and vouchers for prominent retail websites). This definitely sounds like a sweet deal – you don’t spend any money, you get to test your luck and you can potentially benefit from small prizes. People who love the lottery and would like to test it out without any risk should definitely opt for Lucktastic. 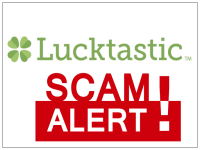 Unfortunately, there is currently a Lucktastic scam circulating around that you should be careful about. As far as the Lucktastic scam is concerned, it doesn’t bring anything new to the table. 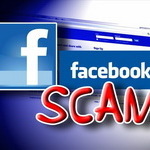 The scammers still rely on an old-school scheme that could potentially appeal to somebody’s desire for easy winnings. 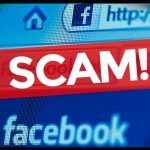 The scam has two dimensions – a part of it occurs on Istagram and there have also been individuals who received phone calls from a so-called Lucktastic representative. The Instagram scam features messages being sent out from fake accounts. The individuals pose as official Lucktastic representatives. In the message, they claim that the respective person being contacted has won a Lucktastic prize. The prize amount varies and so does the “fee” that players have to play in order to obtain the prize. Some Instagram users have reported being asked to pay around 200 dollars for prize processing. In other instances, the fee exceeded 300 dollars. In yet another situation, the recipient was asked to pay two percent of the prize amount for the purpose of claiming it. Such a message on Istagram can come from someone calling themselves Mr. Gomez. There are other fake accounts that present themselves as official Lucktastic pages. Alternatively, the scammers may resort to calling random phone numbers. When they contact someone potentially interested, they will once again present themselves as Lucktastic representatives. Again, the prize being presented is 100,000 dollars. The recipient of the call is asked to pay a processing fee of over 300 dollars for the 100,000 dollars to be sent. One of the individuals that received such a call was smart enough to ask for additional details. While the Lucktastic “representative” claimed that the company’s office was in New York, they provided data (name and an account number) in Jamaica for the purpose of the fee payment. Obviously, this is more than a shady attempt to defraud some naïve individuals of their hard-earned cash. The final thing to understand is that such calls or social media contact attempts are completely illegal. They have nothing to do with the official Lucktastic app. The developers of Lucktastic will never contact potential players or offer actual monetary prizes. This is not how Lucktastic works. As a matter of fact, this is not how any legitimate lottery works. We’ve said it a thousand times and we will say it again – official lotteries will never contact players and prizes aren’t going to be offered if you haven’t even participated in a certain opportunity. Some people find Lucktastic fun, others believe it’s not their cup of tea. No matter what you think about the app, it is 100 percent legitimate and it will never ask you for money in exchange for a prize. Lucktastic itself is a free app and if you know anything about it, you should never fall for the scam. I got contacted via Instagram by a prince_vale48 and by playlucky_corp, saying I won a lot of money and a new 2017 Mercedes-Benz through a lucktastic pots of gold contest, needless to say, they also wanted me to pay $219 via a 2% state to state receipt to Jamaica W. I. (they said it’s in New York) I was brought up with the saying, don’t pay for something you don’t hold in your hands, so after consulting my family members, we all agreed that’s it’s a scam, so I told them ‘sorry, but I can’t pay so give the prize to someone else’ they wouldn’t stop contacting me via phone call, messaging me and Instagram messaging, I just ignored the texts and calls after that and they stopped messaging me. Some of those messages even got rude. I’m glad I didn’t go through with it, gives me more peace of mind to see that there are others with similar experiences. I just received this on facebook and they want me to pay 2% (150.57) for a u.s. clearance receipt and then pay the remaining 4% when I get my money. I had been messaged on Instagram telling me that I won a prize from Lucktastic. I was intrigued but had been scammed in the past so I was also hesitant. The woman, named Sharon again messaged me on Thanksgiving day, as we were driving to family in Pa. She told me I won $250,000 and a new Jeep! I told her that I had to talk to my husband and get back to her. I foolishly gave her my name and phone number, along with address. She told me that “all I had to do” is put down a deposit to hold the prize. When I didn’t get back in touch right away, she messaged me multiple times. After going over it with my husband, we chose to ignore it. THEN, this morning I got a phone call from a Walter Logan from Lucktastic asking why I haven’t claimed my prize. Now my prize was $565,000 and a 2017 Toyota Camry (in purple no less). I told him that I had been scammed in the past and I didn’t want it to happen again. Then the story changes, something about a percentage sent to me via Western Union before I could get the rest. I asked how soon the money would disappear? He was insulted. I said I needed to discuss this with my husband and asked him for a number to get in touch. He gave me 662-270-5982. I don’t think I will return that call! Oh, after all this, I realized that I don’t even play Lucktastic, I play Lucky Day! I have someone contacting me through Instagram as we speak. Some dude named beriwilliam001 on Instagram added me and sent me this such a scam. I just received messages on Instagram for the same thing saying I won 2 million with a $5000 bonus. However id have to pay $200 through western union for a “receipt” to claim my money. I knew it was a scam as soon as he asked if I was familiar with western union. I won 25 cents my first few days playing scratching off a card and I was rewarded the money. Few days later I hit $1000 and when I went back to the main game screen I was never rewarded the money like the 25 cents I won. 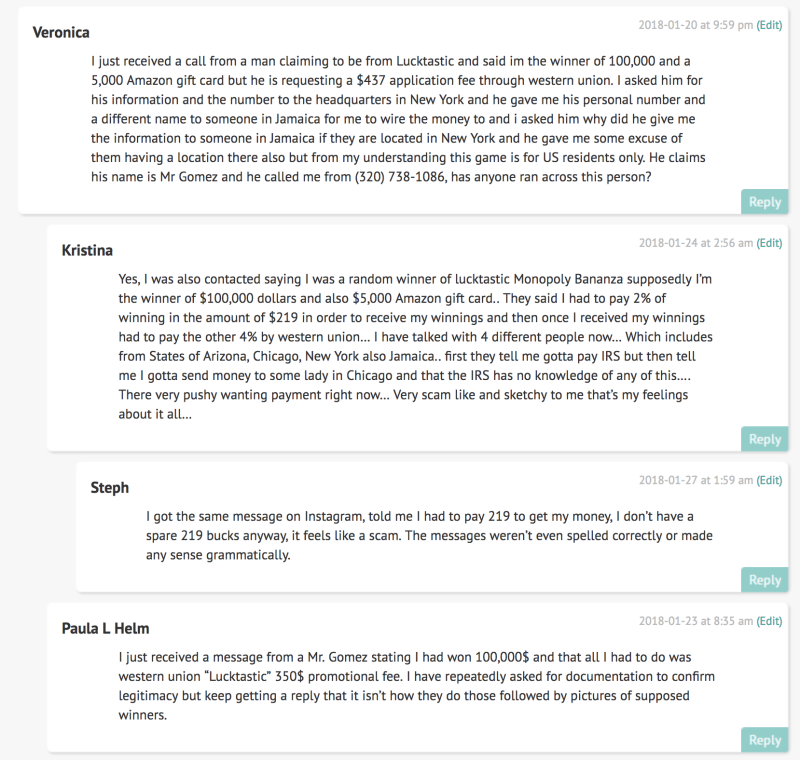 I was contacted by 3 different accounts on Instagram stating that I had won $1,000000 and $10,000 cash in hand up front. They wanted me to go to CVS and pay $299 to obtain a US Claims Receipt in order to have rights to sign for my prize at time of delivery. They stated that 2 US Marshals would accompany them to my house when delivering me my winnings. I went along with it for a few minutes and told the person I didn’t have the money to pay for the receipt they wanted me to obtain and they said that if I could come up with even half of the fee, they would cover the other half for me. The more questions I continued to ask and pressure for details, the longer it took for me to get a response before I stopped getting any response at all. It’s beyond sad what people have come to these days in order to get money. Do legitimate work to earn your own money and stop stealing for people who are holding on to every word in Hope’s that their prayers have finally been answered. This is Verbatim what happened to me today. The exact same story that this person told is what happened to me today. As soon as they were talking about paying for a US claims receipt I knew it was all a total scam. Same here….this guy calls himself Bob Peterson….. number 914-996-7452…. said my fiance won $100,000 and $5,000 Amazon gift card….try to contact him and the phone just rang and no answer, just a machine…. I have been contacted by 6 different profiles in less than 2 hours of each other. Names are as follows. I got one from Clark_Lucktastic on Instagram. And oddly enough not two minutes before someone claimed to be from PCH saying almost the exact same prize. I was contacted on Instagram saying I was randoms selected to receive $100,00.00 and a $50,000.00 Amazon gift card. They want me to send them $299.00 for insurance and delivery of my winnings. Does Lucktastic do this? Or is it a scam? I just got the same message, I called him out for being a scammer, and I got blocked. I was contacted on Instagram by official_Emily_Barnes telling me I won $1,000,000.00, a $1000 Amazon Gift Card, and a 2017 Nissan Altima……I thought it was real until she told me I would have to pay $299.99 for an MTCN confirmation number……..I looked all over Lucktastic to see if I had won anything but there was nothing about me. Why do people have to scam others? Lord knows I am barely staying on top of our bills and do not have an extra 300 for anything. I received a message I won from two different people from Lucktastic…two different winning amounts and variations of things…I was floored. This was on IG that I had posted them to and FB to up my chance of winning. When I was asked to send them 199.99 for my 1% charge I called my daughter to look into this more for me. I told the woman to take the 1% out of the earnings and send the rest via PayPal. She obviously didnt like that answer…nor did she explain how the. 199.99 was “refundable” if I could only send by moneygram thru Walmart..CVS or Walgreens. Sorry…I can not throw away money for money that may or may not be real. Am contacted through a Lucktastic agent that I won 2 million an a vehicle. But have pay over $7000.00 to redeem. Of course I cannot. The agent is saying he is getting sponsor to help pay. I got a message on Sunday saying that I won 250,00 dollars and 12,000 dollars Amazon card. I went to the bank and asked them if it was a scam. And they said yes and I told them that it’s a scam and now whoever it is is threating me they keep saying 2 days and said if I call the cops that it will be worse they told they bugged my phone and they keep threating me I had to block them. I got the same message today saying I won 250,000 and 10,000 amazon card I’m glad I saw your response cause I was going to pay the 2% $160 which makes no sense if I am winning the money. Scam their on Instagram in my DM stating I won $750.000.00 cashier check and a Brand new 2018 Ford-150 and all they want to do is to tell me congratulations. I am not falling for this crap.